This magnificent aluminum memorial Peace Pole was crafted for those who perished during the attacks of September 11th 2001. It is 6 sided and nearly 11 feet tall with a total of 12 translations of May Peace Prevail On Earth. Prayers of peace have been collected from people of all faiths all over the world through our website at www.worldpeace.org. 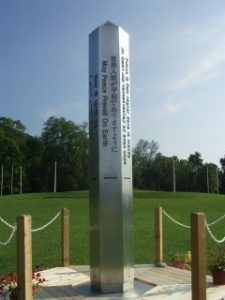 The September 11th Memorial Peace Pole was dedicated in a grand ceremony in 2002 at the World Peace Sanctuary, headquarters of The World Peace Prayer Society in upstate New York.